Heath Park School, a mixed secondary school and sixth form has put security top of the class with the installation of a new wireless electronic access control solution from Tate Solutions Ltd, the specialist access controls and security division of the Securefast Group plc. The school has recently relocated to a brand new campus located in the Heath Town area of Wolverhampton, catering for 1,300 pupils and 140 teaching and support staff. This is an exciting new three-story development complete with the sports hall and outdoor sports facilities, all ready for the new school term in September and beyond. “School security is probably one of the most sensitive issues facing today’s head teachers and trustees. Problems can happen very quickly due to a wide range of incidents including strangers coming into the school, violent actions by children, parents or staff, burglary, theft and arson to name but a few”. “With this in mind pupils need to know they have a safe place in which to be educated and that staff are in a safe place in which to work. Delivering on that is a given but it is not always easy to achieve”. Keith added: “Further problems arise from the fact that while everyone wants their school to be safe, no-one wants it to end up looking look like a prison with high walls and fences. While all of this may make a building secure, it is not user friendly. Our aim was to achieve a sensible balance, implementing sufficient levels of security to cope with perceived threats while providing a pleasant environment in which to learn and work”. To complement their newly constructed school, Heath Park called on Tate Solutions to provide the very latest security system that ensured strictly controlled access into the building, whilst allowing free movement within the facility. The system selected to deliver these objectives was SALTO’s high specification XS4 proximity wireless based solution, which incorporates the very latest technology that provides a safe, secure and almost totally keyless environment for the benefit of both staff and pupils. The XS4 solution is a state-of-the-art electronic lock system that programmes contactless smartcards to allow access to specific class rooms or other areas for selected time periods only, with the doors auto locking at pre-specified times. If security is breached due to the loss or theft of a card, it can be instantly deleted from the system without the need or cost of changing any locks – saving the school time and money. 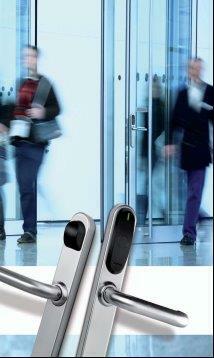 For further information on SALTO XS4 and other access control and security solutions please contact the Tate Solutions team at Securefast plc on 01543 501600 or visit the web site www.securefast.co.uk for a comprehensive insight to our complete range of products.